Who is Causing Facebook to Block Tuller’s Article? On Monday, January 27, 2014, David Tuller published, on Buzzfeed, a well-researched and factual article—”How “Chronic Fatigue Syndrome” Obscures A Serious Illness“—on ME/CFS and the government’s efforts to redefine the disease. As of right now, 78,331 people have viewed the article. Also, almost 8,000 people “liked” the article directly from the Buzzfeed site by using the Facebook like button. Facebook also deleted all postings of this article shared directly from the Buzzfeed website, which means that the many Facebook conversations about the piece are lost as well. Copying and pasting of the article’s URL on Facebook is still possible, but it is important to note that Buzzfeed pays close attention to the number of Facebook shares from its site (as opposed to copying and pasting of the URL, which Buzzfeed has no way of keeping track of) in its determination of whether to feature an article more prominently and also of whether to cover an issue again in the future, something that ME/CFS needs desperately. So, whoever is responsible for getting the article in essence censored by Facebook has done a tremendous disservice to the patient community. It makes one wonder about the person’s or persons’ agenda. This entry was posted in Uncategorized and tagged Buzzfeed, Censorship, David Tuller, Facebook, ME/CFS. Bookmark the permalink. 75 Responses to Who is Causing Facebook to Block Tuller’s Article? This is unacceptable on the part of Facebook. I wrote to them and complained. Abusive? Seriously? Why? Because there is controversy surrounding this? Would love to know who did this. Clearly there is an agenda here. Trying to silence people only goads them to speak louder and with more urgency. Nothing abusive or offensive about Tuller’s factual article at all; very well written and informative. Clearly, (unless it is a ‘technical glitch’) this is MORE sabotage and monkey-business going on–and this needs to be EXPOSED!! Thank you, Jeannette. It would be great to tweet and retweet this blog about it, and maybe post it to reddit, and create an even greater amount of attention to the article than it would have received if it hadn’t got removed from FB in the first place. Ppl have been tweeting. Both David’s article and this blog. Let’s keep it going, folks! PS: if you tweet, do so from the Buzzfeed site! I have! It is an important and well written article which needs circulation! FYI: Did you know Jeanette, that this blog is also reported as malware by Webroot SecureAnywhere? Eddy, do you mean Buzzfeed in general or David’s article or my blog? Thanks! That’s not good. Let me know what you find out, Eddy. Thank you! Virus Total shows 0/51 for malware,trojans or viruses. Webroot was a false positive. That’s so strange… I also shared this article, have to check if it has been deleted from my feed. It must be some form of sabotage! Comments on the recent NPR CFS article have been memory-holed as well. See posts #7 and #20 on the following PR thread. Post #7 was captured before deletion and post #20 was reposted on PR by its author. Another individual said their post was deleted as well. Who knows how many were lost. Who knows why National Public Radio is motivated to censor/delete comments which criticize national public policy? Do we know that NPR deleted and censored the comments itself? I’m not very well informed on the working of web pages and comments. How can we tell? Do Facebook just immediately block an article when it is reported as offensive without even checking if it could be construed that way? It’s unacceptable that someone reported this excellent article as offensive as it is but why do Facebook just accept this without checking If the article is indeed offensive which this article clearly isn’t? Surely more than one person had to report it as offensive for Facebook act? I am astounded this has happened. We need to start a petition – perhaps with Buzzfeed – on Change.org to restore all postings and repostings of the article on FB and demand that our conversation be allowed to continue on the site. The article was not abusive, but factual, with supporting comments that might have have had an emotional tenor. How unusual is that? My post was deleted from my personal page. It won’t let me repost. Never had that happen before. Would be interesting to know what happened. When I tried to post a comment–it DIDN’T post (a couple of days ago) and Tuller’s article has also been removed from my personal page–this is a BIG campaign AGAINST us. Yes. When I checked my facebook pages (I have two facebook accounts), My posts were also gone. Not only that, but I blogged about the article on wordpress. Even though I hit “publish”, it was not on my public blog! I tried to publish it three times to no avail. It was when I took off my tag “David Tuller” that I was finally able to publish it! Now isn’t that interesting? I don’t see how blocking an excellent article about ME serves anyone who is a patient with this disease. And maybe roasting individual patients (no matter what one thinks of their politics,) in the comments section is a bad idea and doesn’t really serve anyone either. I don’t think anyone was roasted. People were having civil discussions. Hope Eddy will find out. meanwhile let’s continue to share and disseminate it in all possible manners. As someone before said, these tactics will only come back as a boomerang to the person or institution involved. The law of cause and effect is irrevocable, our determination just increasing by such actions, isn’t it? It’d be nice if this story were picked up by a traditionally respected news outlet. Buzzfeed has a huge reach. I feel grateful to them for covering us. But regardless of that, the censorship is what’s the issue here. I agree with you, Jeannette :-). I’m just reporting on the responses my husband and I have been getting from some Facebook friends (none of whom are involved with or knowledgable about ME/CFS) on our posts about Facebook’s removal of the Tuller BuzzFeed article. Does anyone know if there’s a way we can all individually alert Facebook to the fact that this article does not legitimately contain abusive content and that they should manually reinstate it? Yes, I hear you. It’s good to get people’s take on what might be going on. There is a way to complain, but I am not able to look it up right now. Since I got the error message, I was able to do it through the link provided. If anybody knows, could you pls put instructions up here. I complained using the “report a problem” button under the cog icon in the top right-hand corner. Technically that’s for bug reports but that was the option that was closest to accurate. Folks could attempt to share the link instead if there’s better a way to complain that shows up during that process. I hope many do as volume is oftentimes the key in situations in this. This is odd, my ‘share’ of the article is off of my page…creepy!! Will cut and paste it. It takes more than one person to block a post on facebook. It takes several people on each person’s wall. Probably the same friends of everyone. Except me, as I removed most of my friends. The only friends that I have as friends are the ones who refused to be bullied and I have not had anything blocked in the two years since my friends list has been cleaned out. This reminds me of an incident a while back. There was a site on FB that was extremely offensive to ME patients. Many ppl complained to FB about it. FB replied basically saying that it wasn’t offensive enough to be shut down. It takes a lot for FB to censor content. I can confirm that; all 4 of my tweets on ME and Lyme, on Stephen Fry’s thread, disappeared and I had not deleted them. I saw that about 50 others had somehow disappeared too. It seems to me that perhaps someone in the government, maybe connected with HHS or some entity related, that may be sabotaging all the efforts to support and promote the ME banner on FB. Serendipitycat mentioned the word, “sabotage.” Now Twitter? This is indeed scary. I have noticed that many of my postings on my FB page have disappeared (not deleted by me), and they were perfectly harmless. Last month, I received a posting from Kim Komando re posts disappearing from our FB pages. Here is the link: http://youtu.be/l9ZqXlHl65g FB is deleting individual posts in order to promote more advertising on FB. This may or may not be part of the reason for disappearing posts; however, since there was a “malware” notice, it may not be. Who knows? A big mystery. I hope somebody (who has more expertise on the internet than I do), will get to the bottom of this fiasco. Have the WATERGATE reporters retired ??? This is BIG!!! AND it MUST BE EXPOSED to the CORE!! AMEN…..Ess !! ….” It MUST be Exposed….to the CORE ….if not for our self’s…AT LEAST for ‘Our’ Children ” ………..Does it START w/ FB ?? Never before have so many people woken up to the possibilty that bacterial infections (stealth pathogens) are involved in a wide range of neurological diseases. The viruses are in the mix too, but it seems that the main causes of chronic infection and debility are the l-forms and spores of certain vector-borne bacteria, especially borrelia. Could it be that those at the very top of the public health system are not ready to admit this, even though they must have been aware of how widespread the incidence was since the early 1990s. ps I copy-pasted the link to my timeline a couple of days ago and that post has been removed. You say un your article that it’s still possible to share that way, but it doesn’t seem to be. Ugh. I had no idea. That’s a whole new twist. Did you know that you can leave a feedback “thumbs up vote” for the article on the page itself? There is a line of ranking buttons from <3, OMG through to EW, and a broken heart at the bottom of the article and just above the comments areas. As I write this there are only 69 ❤ 's, 17 WIN, 1 FAIL and 1 EW. By adding our votes of support via those buttons maybe we can let BuzzFeed know just how valuable we feel the article is. Thanks for letting us know! I didn’t see that. Someone has unjustifiably reported this article as abusive. It is not. It is the opposite. It is a public service to bring awareness and help for a suffering group of people – those of us with ME/CFS. Not only does this article satisfy and uphold your own community standards, but ironically, the person(s) who reported this article as abusive are the ones who have violated your community standards and are practicing hate speech/action by succeeding in silencing the voices of people with a disabling medical condition. This is censorship, and it is unacceptable. Our (people with ME/CFS) ability to be seen or heard is inherently difficult due to our illness that keeps us hidden away, suffering silently in dark rooms. Facebook’s decision to block this article only silences us further. Please restore the sharing of this important article. Many people’s lives and well-being depend on it. This is awesome!!!! Thank you so much. Everybody who has the energy, please follow these instructions. And please make a note of when you did this. Better yet, take a screen shot. Thanks, everybody! Good idea about the screen shot, Jeannette. I did this and saved it on my computer by copying the screen shot into a Word file. The screen shot shows the time and date it was sent in the bottom corner. 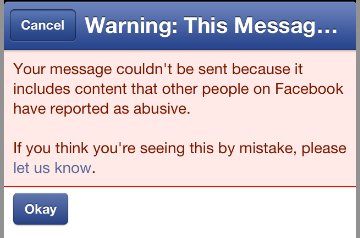 Facebook makes it very easy to report something as abusive, but not so easy for someone to appeal it. Whoever is reporting the article with the motivation to silence us is cowardly and probably knows how difficult it is to get reinstated by Facebook. It’s a hit and run job. May I share your sample letter on FB for those who are to sick to write something themselves? Happy to give you credit!!! Yes, I should have said that in my original post. My letter is meant as a form letter that anyone can use as a starting point for their own, or copy it word for word. But, hopefully we won’t need it anymore. That is great news that Facebook is allowing us to share the article again. And a special thank you to whoever tried to shut down our awareness campaign. You have only fired us up even more. I know that people can object to something on FB, but does anyone know if only one person can cause something like this to happen or does it have to be a certain number of people? Jeannette-as the owner of this blog you need to contact WordPress and find out what is going on with your blog being defined as Malware. i know. and i will. just a bit maxed out right now. PS-I just clicked on your link to the article 3 times and it came up and then went blank. Is anyone else having this issue? It seems to take a second or two to load–then the article comes up–just tried it again now. BUT–later in trying to POST it to FACEBOOK–does NOT allow that!! 2/2/14, 5:29 pm Pacific: Both “sharing” and “liking” on Facebook directly from Buzzfeed is working again. I just got back home from D.C. this weekend and I have been trying to rest up from all the activity last week. Shocked to read about the release of Dr. Montoya’s video that he had asked people not to publish and now checking your blog tonight and I see this next debacle. I swear the story around this illness seems more like a scene from the “Twilight Zone” than anything you would expect to see in real life. If you get more information to back up the “alleged” censorship of this article and/or your blog let me know and I may have some contacts in D.C. who would be very interested into looking into this further. 10:20 PST. I shared from Buzzfeed to my Timeline and it worked. So far. Thank you for you blog and this information ! I was unable to e-mail the article via BuzzFeed to my list of contacts. An error message was received when I pressed send. My detailed message to friends and family, along with my long list of e-mail addresses, disappeared from the screen and the only message that remained behind was the BuzzFeed generated error message. I read that article and really couldn’t see anything in it that would merit it being censored like it is being on Facebook. How strange! here it is: Never before have so many people woken up to the possibility that bacterial infections (stealth pathogens) are involved in a wide range of neurological diseases. The viruses are in the mix too, but it seems that the main causes of chronic infection and debility are the l-forms and spores of certain vector-borne bacteria, especially borrelia. Could it be that those at the very top of the public health system are not ready to admit this, even though they must have been aware of how widespread the incidence was since the early 1990s. Perhaps the (neurological) diseases of MS, Parkinson’s, ME/CFS, Spinal Cerebellar Degeneration, Autism, Alzheimer’s, GWI, Lyme, etc. are all in the same pot–and present as one or the other in terms of the idividual . . . just a little speculation. My original post of the article is back up! Anybody else’s? It would seem that the frank and factually informative interview of Jeannette Burmeister by David Tuller is NOT in keeping with the ‘hush-hush’ ‘keep this ME/CFS disease in the closet’ and label it ‘nutsville’ ploys of those that want it/us to remain hidden and QUIET—for this article is quite obviously NOT abusive. Quite the contrary–the article is informative and educational–describes the REAL story of ME/CFS affecting real lives. Perhaps it is a little too threatening to have this REAL information about ME/CFS prancing out there and and being shared so widely PUBLIC–gaining public attention and educating the public–to have such a REAL picture of a REAL person and her family and what HORRIFIC DEVASTATION this REAL biological disease of ME/CFS causes. Thank you again, Jeannette and David Tuller for going public with a MOST important TRUE story about ME/CFS. I shared the article a few days ago and it disappeared from my newsfeed. I was just able to share again a few minutes ago. I hope it will stay on my feed this time! It is unacceptable that FB would take action to remove this excellent article! HOTMAIL e-account — temporarily blocked due to ‘Microsoft noticing some unusual activity.’ Sooo, I hadn’t checked my hotmail account for a few days–and this msg. greeted me this evening as I was about to send an e-mail–and it was BLOCKED. The ‘unusual activity’ referred to is ALL in regard to ME/CFS reTWEETS and FB repostings. And the beat goes on . . .